Our Final Pac-12 Game: Arizona. UCLA. Here it is and I’m excited like Sean above. Our final Pac-12 game of the year and it involves the two most successful programs in conference history. It’s the title game that we need and deserve. All the season long we proclaimed that the Pac was back and for years now I’ve lauded that the return of these two programs would be paramount to this return to glory. In the past handful of years, you’d be hard pressed to find a better Pac-12 season, a better crop of talent and teams, than this 2013-14 group. And it all comes down to UCLA and Arizona. Color me tickled! Rather than dive into the history of these two (35-40 UCLA advantage) let’s stay in the present and look at what a fun matchup this is on paper. It’s the league (and nation’s) top defense against the league’s top offense (14th in the nation). Fire and ice. We’ve discussed a good chunk of this but here it is visually. 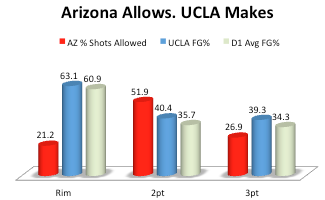 Arizona’s entire defense is built to force teams to shoot the high-risk, low-reward two-point jumper. Notice about that 51.9% of shots against the Wildcats are of this variety. Well 40.4% of the time, when UCLA is taking that variety of shot, they’re making it. That’s the 29th best clip in the land and third best in the Pac-12. I’ve long been a fan of UCLA’s mid-range game – namely Anderson and Adams with spattered frustration at the Wears’ ability to hit that shot. Kyle takes nearly 60% of his shots there and makes 46% of them. Apologies because I can’t contextualize it but that’s the highest such FG% on the team. The D-1 average is 35.7%. If you need a reminder as to what the AZ defense forces, it’s: 21.2/51.9/26.9. You get what the Wildcats allow you. The catch here – and it’s why I showed you UCLA shooting percentages – is that UCLA can make these shots. They’re a terrific shooting team and will not shy away from what they’re given. Or what they take. 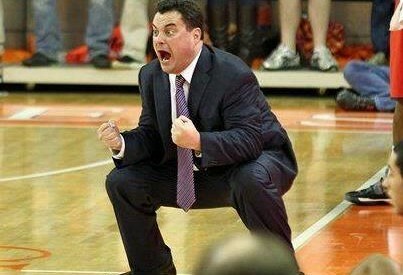 The Bruins have the 4th highest steal percentage in the nation which they use to get moving. A little more than a quarter of UCLA’s offense comes in transition (27.2%). That the thirty second highest such percentage in the nation. They rank sixth in the nation in percentage of first FGAs coming off of a steal. Jordan Adams is UCLA’s All-Time single season steals leader. Theft is a significant part of their game and in January, UCLA stole the ball 12 times from Arizona and forced 17 turnovers – easily the most steals any team has collected against AZ. You saw that the Wildcat defense got what it wanted, but UCLA’s defense fed its offense. Of note, in Arizona’s last eight games, TJ McConnell – Arizona’s point guard – has 47 assists to just 8 turnovers. More fire. More ice. And now you see why I’m fascinated by this game. I was back then (STATS and Q&A) and now – with the stakes at their highest – I can’t wait for 3pm. I could dive further into this, but it’s 70-degrees here in San Francisco and if I’m going to be in a bar all afternoon, I gotta get outside.